Ah, yes…it’s here – the season of the Sagittarius! I’ve been super excited to write this installment of this series being an Archer myself. We are truly a proud bunch and embrace all that comes with our star sign. Any other Sagittarians out there have a fascination with anything with arrows on it and say to yourselves “I must have that!”? Or is that just a select few of us? Please comment because I’d love to know. Freedom loving Sagittarius people don’t usually make a fuss when it comes to their accessories because they are often too focused on where they are headed next. You will usually see them in something functional and universal that will pair with anything they may wear. This blog was super fun and easy for me (whew) because I own everything on this list and don’t know what I would do without each piece. I wear each piece of jewelry listed regularly and don’t get me started on how the bags I’m going to feature have changed my life. Ha! First, coming back to the beginning of this article when I mentioned arrows…I am one of those people who are all about them. I love being a Sagittarius and when Stella and Dot came out with the On The Mark Necklace I wen’t bizerk. I scooped it up right away and it’s probably one of my most worn pieces. I layer it with other pieces too. I love it so much. It comes in silver or gold and has a great price point so makes a great gift. 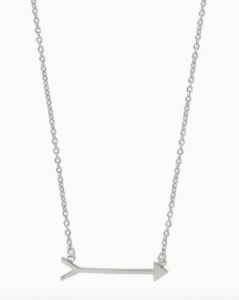 Side note, this necklace has been spotted on Anna Kendrick, and TV show host Samantha Harris. 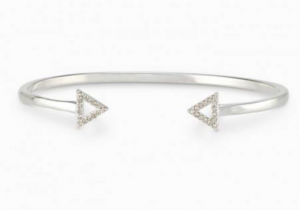 A great cuff for Sagittarius is the Pave Arrow Cuff. This thing is great on its own or stacked with other bracelets. I love it because I have larger wrists and it’s adjustable and comfortable. It’s the perfect balance between edgy and delicate – much like Sagittarius. Plus, arrows! Ha. I promise that will be the last time I mention arrows. With Turquoise being a power color for Sagittarius, there should be at least one piece in every archers jewelry bag. 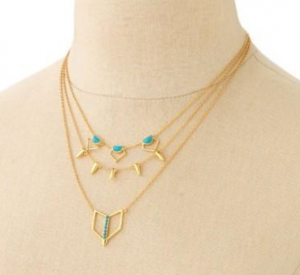 My personal favorite is the Turquoise Stone Layering Necklace. As I mentioned in the beginning of this article, this is a sign that likes their accessories to be convenient for them to wear with anything and this is it! Three strands of semi-precious turquoise geometric stones accented by delicate shiny gold take the guesswork out of layering. Wear with all strands clipped together as one necklace, or unclasp any of the strands to create your favorite combination. In my opinion, it’s a must have. Another great, simple piece I wear all the time (and it’s one of my best sellers) is the Sierra Double Wrap Bracelet. I get compliments on this everywhere I go. 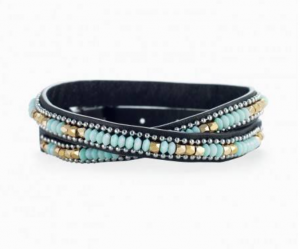 It has hints of semi-precious Turquoise stones and neutral beads throughout. I love it because you can wear this on its own with a white t-shirt and jeans and it makes you look like a rockstar! This is a sign that is always on the hunt for their next adventure. We can’t sit still. We are born globe-trotters and have travel on the brain. I am the type of Sagittarius who will wake up one day and ask her friend “You feel like going to Vegas next weekend?” (It’s happened on a couple occasions. Sagittarians are very spontaneous and love getting up and going! Their bags often have an array of items in it preparing them for any situation. This being said I have two main bags I can’t go without. 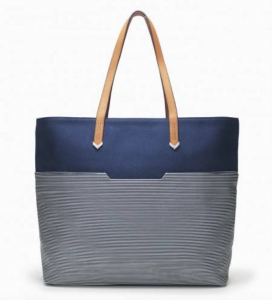 First, the Union Street Tote in Navy Breton Stripe. Genuine leather handles with a wipeable canvas body, and finished with shiny silver chevron details. A classic bag goes a long way. It has co much room! 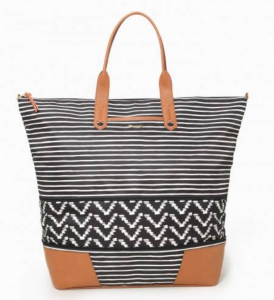 This tote is perfect. It has two slip pockets on the inside and a zipper pocket as well. I have had tote bags before but not like this one. This bag has been my best friend and goes wherever I go. Now, this next bag…I can’t even tell you how this is a Sagittarius travelers dream. 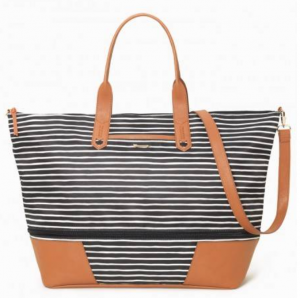 The Getaway Bag is the Beyonce when it comes to weekender bags. It’s stylish, and versatile and when you travel with it, you are sure to get compliments and asked “where did you get that?”. This bag has so much room its insane! It has a zipper that goes all the way around towards the bottom of the bag that when unzipped, pops down an extra 3-4 inches of room all around to the bag. I’ve been able to pack everything I needed for a 7 day vacation in this amazing bag. I want to shake the hand of the genius who made this. Also, it is acceptable as a carry on even when expanded at airports (and fits under your seat). How?!? It’s like a magic bag! I love love love it! Happy Birthday to all you Archers out there. To shop these looks or browse our great Holiday sale check out www.stelladot.com/sites/erinbradshaw and skip the crazyness of the stores this season. Shop from the comfort of your home. Holding a bow and arrow forever pointed toward wider horizons, Sagittarius is on a perpetual quest of discovery. You are idealistic and seek to understand life’s highest potentials. The glyph for Sagittarius is the arrow of the Archer, with a dividing crossbar hinting at duality, indecision and restlessness. The lower part of the shaft suggests an animal nature, while the tip points to expression of great physical and intellectual energy. Early spring favors quit reflection. Jupiter, your ruler, is retrograde until April 9. 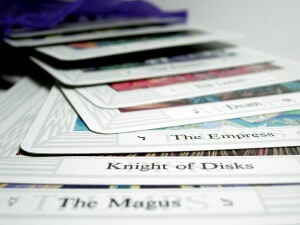 This may involve a spiritual retreat, as your 9th house is highlighted. Finish any partially completed projects. Mid-April through May 7 a Venus transit through your sector of partnership has you rejoicing at the success of someone close to you. Dedicate May Eve rites to blessing your closest relationships. By mid-May Mars will oppose your Sun. This competitive influence lasts until June 24. Don’t make demands or issue ultimatums. Remain good humored. Approach volatile situations like a game and all will be well. The Full Moon in Sagittarius on June 2 pivots around several mutable sign placements and ushers in a very busy cycle. Get organized to relieve stress and move forward during the weeks before the summer solstice. 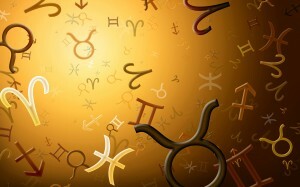 July brings a sense of reprieve as Saturn will have excited your birth sign. This lighter, more relaxed tone lingers until September 18. When Saturn reenters Sagittarius. 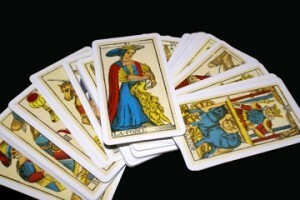 July 24 – August 7 favors study, travel and public speaking as a great trine of in fire signs is emphasized by Mercury. From mid- August through the autumnal equinox, Venus and Mars trine your Sun bringing enhanced vitality and charisma. Enjoyment of various creative projects, social gatherings and sports will peak during late summer. October brings Venus, Mars and Jupiter together in Virgo, your 10th house of fame and fortune. Opportunities for professional recognition are present. Greater respect for status are likely. Remain dedicated and make an extra effort. Unexpected developments can take your ambitions in a new direction. 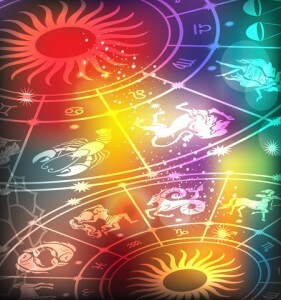 Talkative friends offer ideas concerning the All Hollows celebration, as Mercury affects your 11th house. November 1 – 12 brings a contemplative mood, as your 12th house is accented . Avoid crowds, enjoy a solitary walk, revel in the late autumn scenery and heed nature’s omens. On November 13 Mars changes signs and will sextile your Sun, an aspect that will remains until early January. This is a very social influence, and invitations to various gatherings arrive. Mercury conjoins your Sun November 21 – Dec 9. You will be exceptionally eloquent, and your words can inspire others . Write a yuletide poem or story and make copies to include with holiday gifts and cards. Travel appeals to you near your birthday. From the winter solstice through December 31 your 2nd and 8th houses of finances, earnings and investments are activated. The Full Moon in Cancer on December 25 illuminates the specifics. Devote spiritual rites to prosperity magic. Budgeting, free cycling and bargain hunting are worthwhile now. Venus enters your sign as the New Year begins. 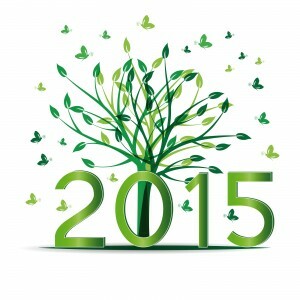 Jan 1 – 23 adds beauty to your life through love, music and creative projects. Jupiter turns retrograde in your carrier sector by mid – January, a trend which continues through the end of winter. Be aware of repeating patterns at work. Manage your time wisely. Your reputation precedes you. At Candlemas reflect on healing troubled memories. Light candles with the intent of understanding and releasing the past while brighting a clear path toward the future. Feb 8 – 29 brings Aquarius transit to your 3rd house. Inspirational ideas arise during conversations. The time passes quickly, and you’ll be busy. Mars enters Sagittarius on March 6. Your energy level will be exceptional the rest of the month. Home life and living arrangements are changing due to the total solar eclipse on March 8. A move is possible. Your mood is fiery. Control impatience and anger as winter ends. Several years ago I woke early while staying at a village along the Mekong Delta. I watched a short, lovely woman usher two children into a long canoe carved out of a log. She wore a bonnet, a toothless smile, and her hands looked big and strong yet soft and gentle; a Mama’s hands. It was fall and thus the first day of school. I watched Mama push away from the stilt building and canoe the youngsters away. I later learned that school was two miles away, and that Mama had done this with other children who came along before the two I just witnessed. She believed in them, believed in fairness and wanted her children to have a fair chance. She had a clear idea of a bigger picture for them, yet she was practical, sturdy and earthy enough to make that bigger picture happen even if it meant rowing a log up a river every morning–getting those kids to school, getting them moving, arming them with intelligence. Mama and the canoe was such a humble and beautiful scene it is to me the epitome of a Sagittarius-Capricorn cusper. What you get is a mix of fiery, visionary focus and action aimed at making the world a better place, adjusting the odds for someone who might not otherwise have a fair chance. Remember, if you will, Artemis or Diana or Robin of Locksley (Katniss Everdeen if you are shy with mythology). Then you mix this fireball of fairness and vision with the lumbering, granite-sturdy practicality of Capricorn’s earthen resolve. I know, I sound like I am promoting a boxing match between Saturn (Lord of Restriction, Cardinal Earth) and Jupiter (Lord of Fortune, Mutable Fire). 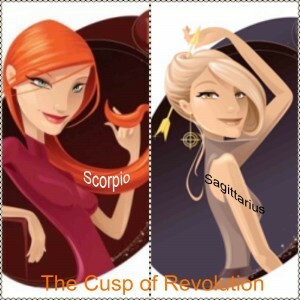 But I am not promoting a duel of any sort because Sagittarius and Capricorn meet in the cusp almost perfectly. The only real problem area is when intensities are not managed or tempered there is a tendency to feel at the mercy of one’s moods and get a bit dark and moody. Date Range: December 19th through December 25th, respectively. What they need: These cuspers need to see others doing their best. Why? Because when Sagittarius-Capricorn cuspers commit to something, they put it all in and will expect others to do the same. Relationships: In relationships the Sagittarius-Capricorn will often be the epitome of the speed-up-slow-down, hurry-up-and-wait relationship partner. Why? 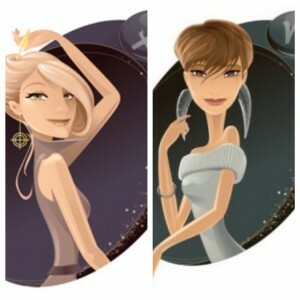 The biggest challenge here is balancing Sagittarius’ desire to go fast with Capricorn’s slow and steady pace. This can sometimes lead to some dark and quiet slow periods–i.e., “Where did they go? And why aren’t they communicating?” These cuspers are, however, innately loving and hardworking. So when their relationship switch is in the “On” position, they are the perfect partner. Strengths: Successful and they don’t quit. Loyal. They have zero propensity for deceit. When involved with something cutting-edge that will most likely benefit others, this cusper is outgoing, funny, resilient, and ever the uplifter. These cuspers are devoutly fair, and they are naturally good with children. Weaknesses: The only real rough spot these cuspers have is the effort factor. When they dive into something, they will give their all and stay to the very end–that is, they will make it work, make it happen, whatever it is. This means if you are involved or working with a Cusp of Prophecy cusper and you do not give your all or need to back-out of said project before it reaches fruition, you’re gonna get heat. What they love: They love ambition, and Big Dreams: dreams that change the world; and it doesn’t if it is their dream or someone else’s, if they jump in, they will stay to the end. Name of Cusp: Cusp of Prophecy. I have, however, heard these delightful beings being referred to as Sagicorns. Cusp of Prophecy Famous Personalities: Ralph Fiennes, Humphrey Bogart, Jake Gyllenhaal, Kiefer Sutherland, Sissy Spacek, Jimmy Buffet, two of the BeeGees (Robin and Maurice Gibb), Phil Donahue, Ricky Martin, and Mary Higgins Clark. Like other fire signs, a Sagittarius is full of energy and thrives in environments with lots of stimulation. Sagittarius is a sign that loves adventure and are freedom-loving people. They like to be around people and feed off of other peoples energy. Sagittarius is the sign of The Archer so naturally they aim high when it comes to their career goals. They are very reliable people who are good communicators and are well-liked so this is a sign that is born for a leadership role. This is a rather unique sign as those who fall under this sign tend to be the kind of people who fall into careers for the sheer passion and not the paycheck. Money and materialistic things are not the main motivators when it comes to choosing a career path for a Sagittarius. They will put in extra time and work to help a fellow worker simply to lend a hand not thinking of the extra hours. This is a sign that loves to help people with problems on any scale. No questions asked. 1. 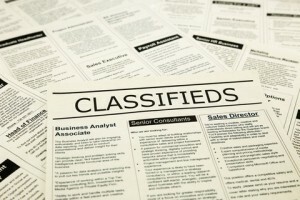 Recruiter for Peace Corp / Military- As a Sagittarius in your youth you may want to get out and travel the world and help those less fortunate as you were born to do. You are a born leader and have so much love and knowledge to give and pass on to others and by exploring this field as an option gives you the ability to do this while securing your future. When you come back from your own adventure you can help recruit and inspire groups of people like yourself who want to help others and explore the world and themselves and maybe don’t quite know the steps to take. 2. Veterinarian- The archers love for animals is great and the day to day interaction with animals will be a great spirit lifter for any Sagittarius. Sagittarius people love to learn new tricks of any and all trades and to use that knowledge to advance medicine and care for animals would make any Sagittarius feel complete. 3. Promoter- Using their creativity and attention to the littlest details, Sagittarius makes for a great promoter of goods and services. They are very outgoing people and can spark up a conversation with anyone and always have the latest information on whatever is going on. They are always in the know. People find them fun and like to hear what they have to say so getting a Sagittarius to promote your product is a great idea because they will take it all the way to the top and make sure it really gets its name out there! Picture, if you will, a fearless serial killer who does not harm people but destroys any and all stereotypes–a serial killer of stereotypes! If you can picture that, then you will understand the Scorpio-Sagittarius-Cuspers; Mars, Pluto, and Jupiter energy: brute force, unbridled fearlessness, and disdain for limitation. Similarly are the Baby-boomers; they thrived on rebelling against authority in their younger years, but now that they are in the autumn of their day they find that they are the ones holding the talking stick. Ironic, isn’t it? All mountains are formed and developed along a similar life-path: great upheaval and rebellion followed by generous beauty and majesty and dominion. Don’t let the rebellion or destructive tendencies scare you. The Pluto influence is a profluence of death and regeneration, death that is the antecedent of change and growth. Consider the great Sufis and Whirling Dervishes who sought to die a thousand times a day. The fine art of burning away the falsehoods so that truth can rise like a Phoenix from the ashes. William Blake, an English Romanticist and poet, also one of my favorite Sagittarians, requested that his burial epitaph read: “Here lies a man who has died a thousand times.” I want to be like that, and I know you do too. Growth and then surrender to a newer and more evolved version of one’s self. Scorpio-Sagittarius-Cuspers are oh so good at this. Date Range: November 19th through November 24th. What they need: They need balance, they need a focus or a mission or it will seem as if they are running wild or are looking for a fight (e.g., Billy the Kid). Relationships: Scorpio-Sagittarius-Cuspers make dynamic and loyal lovers, especially when they believe you love them, and they happen to have a lifestyle that is a balanced one. What will stand out is their open mind and a highly evolved sense of humor. Half-of-love does not appeal to this character–this means they are better suited for the all-or-nothing monogamous style of relationship or no relationship at all. Strengths: Adventurous (i.e., wild), passionate, sophisticated, blunt, Generous (with a capital G), energetic, profound, self-reliant, progressive, spiritual, didactic. Weaknesses: Selfishness, bluntness, compulsiveness. In their younger years they often appear wild (don’t worry, when they get older they will be boldly self-disciplined and fearless), bossy, self-centered, restless. What they love: They love freedom, for themselves and others. They like seeing others expressing freedom or breaking out of being boxed in. They love to be in charge, especially if they think they are carving a new path through the jungle. They love most things that are egalitarian. Cusp of Beauty Famous Personalities: John F. Kennedy Jr., Robert F. Kennedy, Billy the Kid, Voltaire, Bjork, Meg Ryan, Jamie Lee Curtis, Jodie Foster, Indira Gandhi, Larry King, and Calvin Klein, etc. Aries: Drinks with a bit of spice or is best for the typical fiery Aries. To satisfy their fun non-stop side adding a bit of powerful fruit flavors to their beverage. Aries are charmers and tend to get a bit flirty if they drink too much (and they will keep going all night) if they are challenged to a drinking contest so it’s best for this sign to have something with the right mixtures so they can be feeling good with just 1 or 2 drinks instead of an all night shot chugging contest. Take your glass and lime slices. 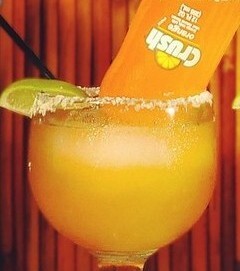 Gently run the lime along the edge of the glass to get it a bit sticky then rim the glass with your salt. Blend Ice, Tequila, Triple Sec, Lime Juice, and Orange Juice together until you get the consistency you desire by adding more or less ice to the blended mix. Pour mixture into your salt-rimmed glass and garnish with a sliced lime then take your bottle of orange soda, take the cap off and carefully place it at an upside-down angle in your glass and enjoy your cool summer treat. Take a shaker with ice and shake the mango juice, orange juice, and pineapple juice (and syrup if you’re going with the strawberry syrup instead of fresh strawberries), strain into an ice-filled glass. Add the ginger ale and sprinkle with grated nutmeg. (If you are using the fresh strawberry method then add them along with the ginger ale.) Delicious summer treat for the non drinkers and the dash of nutmeg adds that bit of bite for the Aries! Leo: Leo’s have colorful personalities. They are bold, creative and enjoy the finer things in life like lounging around the pool with the people they love. They car a lot about their image so they tend to be a bit on the healthy side as much as possible so these fruit infused drinks are sure to be a hit for the smooth Leo. Pour the red layer mixture to fill about 1/3 of your glass. For the yellow layer, pour that mix directly down the center. Enjoy! Slice the watermelon in half and scrape the insides out using a spoon. Once you have gotten all the fruit from the center of the melon, place it in a large blender and add the lemon juice, strawberries, sugar, and ice. Blend the mix until it’s pureed then pour the lemonade straight from your blender, or pour into a pitcher. Pour it into the two empty halves of the watermelon, add a skewered strawberry and lemon for garnish, grab a funky straw and enjoy your fruity beverage by the pool. Sagittarius: Born adventures this sign likes anything exotic and fun. 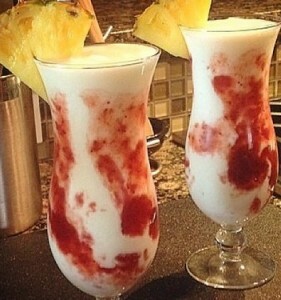 A Sagittarius will try anything once so they like drinks with lots of different flavors with a bit of a kick! 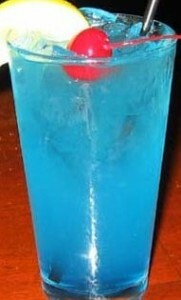 Add vodka, rum, tequila, blue curaçao, and ice into a shaker. Grab a glass with some ice, pour your mixture into the glass. Add a slash of sweet and sour mix and top it off with sprite. Note: To make this into a summer slushy just blend ice and pour the mixture over and sip through a straw to keep it extra refreshing and cool. Blend all of the ingredients in a blender and blend until the mixture is smooth. Pour the mixture into glasses with ice and garnish with pineapple slices.